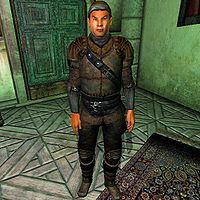 Rufrius Vinicius is an Imperial monk and a Defender of the Fighters Guild in Anvil. He offers basic training in Hand to Hand, but will only offer his services to members of the Fighters Guild. Compared to his fellow guild members, Rufrius takes it easy in life and spends most of the day strolling around the guildhall. He sleeps in the large bedroom area in the northeastern part of the ground floor every night between midnight and 6am. After waking up, he spends all day on either the ground floor or in the dining area on the second floor, just relaxing and chatting with the other members. At 8pm, he finally sits down and eats a two-hour dinner in the dining area. After his meal, he will spend the two remaining hours strolling around until his bedtime at midnight. He offers training when he is not sleeping or eating. He doesn't carry a weapon, relying solely on his hand-to-hand skills. During the day, he wears a set of leather boots, cuirass and greaves. When he goes to bed, he slips into a more comfortable set of randomly selected middle-class attire. When you meet him for the first time, he will introduce himself and get right down to business: "I'm Rufrius Vinicius, Fighters Guild Hand-to-Hand trainer." When you ask him about Anvil, he will give you a piece of advice: "You're not from around here, are you? Just a warning... be careful if you go swimming. It's the slaughterfish. They'll swarm you." His reputation as a fighter has spread throughout Anvil, and the citizens can be heard to remark that "Rufrius Vinicius is good with his fists. I've seen him in action, and it's impressive", "I saw Rufrius Vinicius knock a man down with one punch. I wish he'd teach me a bit about hand-to-hand combat. ", "He's quite the pugilist." and "I wouldn't want to mix it up with him." Rufrius' training as a monk has left him with a set of leveled Alteration spells to augment his hand-to-hand ability. These are mostly defensive - Shield, plus Fire, Frost and Shock Shield - but also include a Burden spell.